The Phalanx CIWS (pronounced "sea-wiz") is a close-in weapon system for defense against anti-ship missiles, helicopters, etc. It was designed and manufactured by the General Dynamics Corporation, Pomona Division (now a part of Raytheon). Consisting of a radar-guided 20 mm Vulcan cannon mounted on a swiveling base, the Phalanx has been used by multiple navies around the world, notably the U.S. Navy on every class of surface combat ship with the exception of the San Antonio-class LPD, by the Canadian Royal Canadian Navy, the British Royal Navy, and by the U.S. Coast Guard aboard its Hamilton and Legend-class cutters. The Phalanx is used by 15 other allied nations. Phalanx CIWS aboard USS Jason Dunham. • Naval: Armor-piercing tungsten penetrator rounds with discarding sabots. The Phalanx CIWS Block 1B mounted on the Oliver Hazard Perry-class frigate, USS Elrod in mothballs at the Philadelphia Navy Yard. A land variant, known as the LPWS (Land Phalanx Weapon System), part of the C-RAM system, has recently been deployed in a short range missile defense role, to counter incoming rockets, artillery and mortar fire. 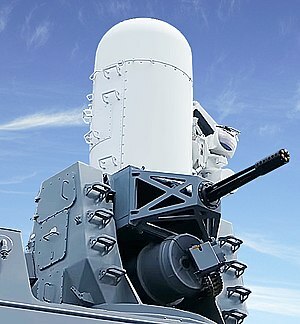 Because of their distinctive barrel-shaped radome and their automated nature of operation, Phalanx CIWS units are sometimes nicknamed "R2-D2" after the famous droid character from the Star Wars films. 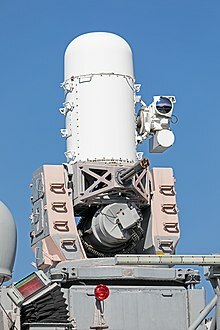 The Phalanx Close-In Weapons System (CIWS) was developed as the last line of automated weapons defense (terminal defense or point defense) against antiship missiles (AShMs or ASMs) and attacking aircraft, including high-g and maneuvering sea-skimmers. The Phalanx prototype on USS King in 1973. The first prototype system was offered to the U.S. Navy for evaluation on the destroyer leader USS King in 1973 and it was determined that additional improvements were required to improve performance and reliability. Subsequently, the Phalanx Operational Suitability Model successfully completed its Operational Test and Evaluation (OT&E) on board the destroyer USS Bigelow in 1977. The model exceeded operational maintenance, reliability, and availability specifications. Another evaluation successfully followed, and the weapon system was approved for production in 1978. Phalanx production started with orders for 23 USN and 14 foreign military systems. The first ship fully fitted out was the aircraft carrier USS Coral Sea in 1980. The Navy began placing CIWS systems on non-combatant vessels in 1984. The basis of the system is the 20 mm M61 Vulcan Gatling gun autocannon, used since 1959 by the United States military on various tactical aircraft, linked to a Ku band fire control radar system for acquiring and tracking targets. This proven system was combined with a purpose-made mounting, capable of fast elevation and traverse speeds, to track incoming targets. An entirely self-contained unit, the mounting houses the gun, an automated fire-control system and all other major components, enabling it to automatically search for, detect, track, engage, and confirm kills using its computer-controlled radar system. Due to this self-contained nature, Phalanx is ideal for support ships, which lack integrated targeting systems and generally have limited sensors. The entire unit has a mass between 12,400 to 13,500 lb (5,600 to 6,100 kg). Rounds from a Mk-15 Phalanx CIWS from the guided missile destroyer USS Mitscher hit ex-USNS Saturn during a sinking exercise (SINKEX), 2010. Due to the evolution of threats and computer technology, the Phalanx system has been developed through several configurations. The basic (original) style is the Block 0, equipped with first-generation, solid-state electronics and with marginal capability against surface targets. The Block 1 (1988) upgrade offered various improvements in radar, ammunition, computing power, rate of fire, and an increase in maximum engagement elevation to +70 degrees. These improvements were intended to increase the system's capability against emerging Russian supersonic antiship missiles. Block 1A introduced a new computer system to counter more maneuverable targets. The Block 1B PSuM (Phalanx Surface Mode, 1999) adds a forward-looking infrared (FLIR) sensor to make the weapon effective against surface targets. This addition was developed to provide ship defense against small vessel threats and other "floaters" in littoral waters and to improve the weapon's performance against slower low-flying aircraft. The FLIR's capability is also of use against low-observability missiles and can be linked with the RIM-116 Rolling Airframe Missile (RAM) system to increase RAM engagement range and accuracy. The Block 1B also allows for an operator to visually identify and target threats. As the system model manager, the U.S. Navy is in the process of upgrading all their Phalanx systems to the Block 1B configuration. All U.S Navy Phalanx systems are scheduled for upgrade to Block 1B by the end of FY 2015. In addition to the FLIR sensor, the Block 1B incorporates an automatic acquisition video tracker, optimized gun barrels (OGB), and Enhanced Lethality Cartridges (ELC) for additional capabilities against asymmetric threats such as small maneuvering surface craft, slow-flying fixed and rotary-winged aircraft, and unmanned aerial vehicles. The FLIR sensor improves performance against antiship cruise missiles, while the OGB and ELC provide tighter dispersion and increased "first-hit" range; the Mk 244 ELC is specifically designed to penetrate antiship missiles with a 48 percent heavier tungsten penetrator round and an aluminum nose piece. Another system upgrade is the Phalanx 1B Baseline 2 radar to improve detection performance, increase reliability, and reduce maintenance. It also has a surface mode to track, detect, and destroy threats closer to the water's surface, increasing the ability to defend against fast-attack boats and low-flying missiles; the Baseline 2 radar upgrade is to be installed on all U.S. Navy Phalanx system-equipped vessels by FY 2019. The Block 1B is also used by other navies, such as Canada, Portugal, Japan, Egypt, Bahrain, and the UK. In April 2017, Raytheon tested a new electric gun for the Phalanx allowing the system to fire at varying rates to conserve ammunition. The new design replaces the pneumatic motor, compressor, and storage tanks, reducing system weight by 180 lb (82 kg) while increasing reliability and reducing operating costs. The CIWS is designed to be the last line of defense against antiship missiles. Due to its design criteria, its effective range is very short relative to the range of modern ASMs, from 1 to 5 nautical miles (2 to 9 km). The gun mount moves at a very high speed and with great precision. The system takes minimal inputs from the ship, making it capable of functioning despite potential damage to the ship. The only inputs required for operation are 440 V AC three-phase electric power at 60 Hz and water (for electronics cooling). For full operation, including some nonessential functions, it also has inputs for ship's true compass heading and 115 V AC for the PASS subsystem. A technician checks the radar transmitter and microwave assemblies of a Phalanx CIWS, most likely a Block 0. On the unit in the background, the search radar can be seen at the top left with the vertical, orange-peel shaped, tracking radar below it. The CIWS has two antennas that work together to engage targets. The first antenna, for searching, is located inside the radome on the weapon control group (top of the white-painted portion). The search subsystem provides bearing, range, velocity, heading, and altitude information of potential targets to the CIWS computer. This information is analyzed to determine whether the detected object should be engaged by the CIWS system. Once the computer identifies a valid target (see details below), the mount moves to face the target and then hands the target over to the tracking antenna. The track antenna is extremely precise, but views a much smaller area. The tracking subsystem observes the target until the computer determines that the probability of a successful hit is maximized and then, depending on the operator conditions, the system either fires automatically or recommends fire to the operator. While firing, the system tracks outgoing rounds and 'walks' them onto the target. U.S. Navy sailors load tungsten ammunition (white sabots at right) and offload dummy ammunition (left). The Block 0 CIWS mounts (hydraulic driven) fired at a rate of 3,000 rounds per minute and held 989 rounds in the magazine drum. The Block 1 CIWS mounts (hydraulic) also fired at 3,000 rounds per minute with an extended magazine drum holding 1,550 rounds. The Block 1A and newer (pneumatic driven) CIWS mounts fire at a rate of 4,500 rounds per minute with a 1,550-round magazine. The velocity of the rounds fired is about 3,600 feet per second (1,100 m/s). The rounds are armor-piercing tungsten penetrator rounds or depleted uranium with discardable sabots. The Phalanx CIWS 20 mm rounds are designed to destroy a missile's airframe and make it unaerodynamic, thus keeping shrapnel from the exploding projectile to a minimum, effectively keeping secondary damage to a minimum. The ammunition handling system has two conveyor belt systems. The first takes the rounds out of the magazine drum to the gun; the second takes empty shells or nonfired rounds to the opposite end of the drum. The 20 mm APDS rounds consist of a 15 mm penetrator encased in a plastic sabot and a lightweight metal pusher. Shells fired by the Phalanx cost around $30 each and the gun typically fires 100 or more when engaging a target. A sailor sits at a CIWS Local Control Panel (LCP) during a general quarters drill. Is the range of the target increasing or decreasing in relation to the ship? The CIWS search radar sees contacts that are out-bound and discards them. The CIWS engages a target only if it is approaching the ship. Is the contact capable of maneuvering to hit the ship? If a contact is not heading directly at the ship, the CIWS looks at its heading in relation to the ship and its velocity. It then decides if the contact can still perform a maneuver to hit the ship. Is the contact traveling between the minimum and maximum velocities? The CIWS has the ability to engage targets that travel in a wide range of speeds; however, it is not an infinitely wide range. The system has a target maximum-velocity limit. If a target exceeds this velocity, the CIWS does not engage it. It also has a target minimum-velocity limit, and does not engage any contact below that velocity. The operator can adjust the minimum and maximum limits within the limits of the system. There are many other subsystems that together ensure proper operation, such as environmental control, transmitter, mount movement control, power control and distribution, and so on. It takes six to eight months to train a technician to maintain, operate, and repair the CIWS. On 10 February 1983, USS Antrim was conducting a live-fire exercise off the East Coast of the United States using the Phalanx against a target drone. Although the drone was successfully engaged at close range, the target debris bounced off the sea surface and struck the ship. This caused significant damage and fire from the drone's residual fuel, which also killed a civilian instructor aboard this ship. On 13 October 1989, USS El Paso was conducting a live-fire exercise off the East Coast of the United States using the Phalanx against a target drone. The drone was successfully engaged, but as the drone fell to the sea, the CIWS re-engaged it as a continued threat to El Paso. Rounds from the Phalanx struck the bridge of USS Iwo Jima, killing one officer and injuring a petty officer. On 25 February 1991, during the first Gulf War, the Phalanx-equipped frigate USS Jarrett was a few miles from the U.S. Navy battleship USS Missouri and the British destroyer HMS Exeter. 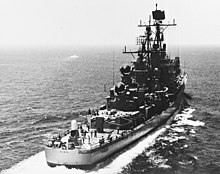 The ships were thought to be under attack by an Iraqi Silkworm missile (often referred to as the Seersucker), at which time Missouri fired its SRBOC chaff countermeasures. The Phalanx system on Jarrett, operating in its automatic target-acquisition mode, fixed on Missouri's chaff, releasing a burst of rounds. From this burst, four rounds hit Missouri, which was 2–3 miles (3.2–4.8 km) from Jarrett at the time. There were no injuries. No missile had in fact been fired, but the chaff firing was in response to an erroneous "missile firing alert" that was actually an oil well head going up. The Iraqis had been setting the oil wells alight in Kuwait for some days. Exeter had relieved HMS Gloucester in the Northern Persian Gulf a few days before and in the weeks before that, Gloucester had shot down a Silkworm missile aimed at Missouri. On 4 June 1996, a Japanese Phalanx accidentally shot down a US A-6 Intruder from the aircraft carrier USS Independence that was towing a radar target during gunnery exercises about 1,500 miles west of the main Hawaiian island of Oahu. A Phalanx aboard the Asagiri-class destroyer JDS Yūgiri locked onto the Intruder instead of the target or tracked up the tow cable after acquiring the towed-target. Both the pilot and bombardier/navigator ejected safely. A post-accident investigation concluded that Yūgiri's gunnery officer gave the order to fire before the A-6 was out of the CIWS engagement envelope. Seeking a solution to continual rocket and mortar attacks on bases in Iraq, the U.S. Army requested a quick-to-field antiprojectile system in May 2004, as part of its Counter-Rocket, Artillery, Mortar initiative. The end result of this program was the "Centurion". For all intents and purposes a terrestrial version of the Navy's CIWS, the Centurion was rapidly developed, with a proof-of-concept test in November that same year. Deployment to Iraq began in 2005, where it was set up to protect forward operating bases and other high-value sites in and around the capital, Baghdad. Israel has purchased a single system for testing purposes, and was reported to have considered buying the system to counter rocket attacks and defend point military installations. However, the swift and effective development and performance of Israel's indigenous Iron dome system has ruled out any purchase or deployment of Centurion. Each system consists of a modified Phalanx 1B CIWS, powered by an attached generator and mounted on a trailer for mobility. Including the same 20 mm M61A1 Gatling gun, the unit is likewise capable of firing 4,500 20 mm rounds per minute. In 2008, there were more than 20 CIWS systems protecting bases in the U.S. Central Command area of operations. A Raytheon spokesman told the Navy Times that 105 attacks were defeated by the systems, most of them involving mortars. Based on the success of Centurion, 23 additional systems were ordered in September 2008. Like the naval (1B) version, Centurion uses Ku-band radar and FLIR to detect and track incoming projectiles, and is also capable of engaging surface targets, with the system able to reach a minus-25-degree elevation. The Centurion is reportedly capable of defending a 0.5 sq mi (1.3 km2) area. One major difference between the land- and sea-based variants is the choice of ammunition. Whereas naval Phalanx systems fire tungsten armor-piercing rounds, the C-RAM uses the 20 mm HEIT-SD (High-Explosive Incendiary Tracer, Self-Destruct) ammunition, originally developed for the M163 Vulcan Air Defense System. These rounds explode on impact with the target, or on tracer burnout, thereby greatly reducing the risk of collateral damage from rounds that fail to hit their target. Phalanx (Block 1A) live fire test aboard USS Monterey in November 2008. ^ a b Storm.mg. "凱子軍購？海軍先斬後奏買方陣快砲 價格比英、韓貴1倍-風傳媒". ^ a b c "The US Navy – Fact File". Navy.mil. 2009-11-09. Retrieved 2010-04-13. ^ a b c d e Tony DiGiulian (2010-06-16). "USA 20 mm Phalanx Close-in Weapon System (CIWS)". NavWeaps.com. Retrieved 2010-10-26. ^ John Pike (2005-04-27). "MK 15 Phalanx Close-In Weapons System (CIWS)". Globalsecurity.org. Retrieved 2010-04-13. ^ "Amphibious Transport Dock". www.public.navy.mil. ^ a b "Murdoc online March 20, 2006 CIWS now does surface targets, too". Murdoconline.net. Retrieved 2010-04-13. ^ Sieff, Martin (November 3, 2006). "Phalanx Has a Future". Spacewar.com. Retrieved October 2, 2017. ^ "TELUS, news, headlines, stories, breaking, canada, canadian, national". Home.mytelus.com. Archived from the original on 2011-07-14. Retrieved 2010-04-13. ^ a b "Raytheon Company: Phalanx". Raytheon.com. Retrieved 2010-04-13. ^ "Raytheon Awarded Phalanx 1B Upgrade Order for Royal Navy". Prnewswire.com. Retrieved 2010-04-13. ^ "CIWS: The Last Ditch Defense" (PDF). ^ "USS Antrim (FFG 20)". Navysite.de. Retrieved 2012-08-04. ^ "USS Antrim FFG-20". Historycentral.com. Retrieved 2012-08-04. ^ Plunkett, A.J. (October 12, 1989). "Iwo Jima Officer Killed In Firing Exercise". Daily Press. Retrieved 2013-08-16. ^ "Tab-H Friendly-fire Incidents". Gulflink.osd.mil. Retrieved 2010-04-13. ^ Cable News Network. Japan apologizes for gunning down U.S. plane. June 4, 1996. ^ The Virginian-Pilot. Human Error Cited In Downing Of Navy Plane By Japanese Archived 2007-10-15 at the Wayback Machine. October 24, 1996. ^ "Transcript of the DoD investigation of the incident". ^ a b "Army C-RAM Intercepts 100th Mortar Bomb in Iraq". Defense-update.com. 2007-06-07. Archived from the original on 2009-12-31. Retrieved 2010-04-13. ^ a b c "Navy News, news from Iraq". Navy Times. 2005-06-27. Retrieved 2010-04-13. ^ "First C-RAM joint intercept battery organizes for combat. – Free Online Library". Thefreelibrary.com. Retrieved 2010-04-13. ^ "BMD Focus: Barak dithered on Phalanx". Spacewar.com. Retrieved 2010-04-13. ^ 23-Apr-2009 13:20 EDT (2009-04-23). "A Laser Phalanx?". Defenseindustrydaily.com. Retrieved 2010-04-13. ^ a b c d e f g h i "Mk 15 Phalanx Block 0 / CIWS, Close-In Weapon System". Deagel.com. 2010-03-07. Retrieved 2010-04-13. ^ "World Navies Today: india". Hazegray.org. 2002-03-24. Retrieved 2010-04-13. ^ a b c d e "Mk 15 Phalanx Block 1B / CIWS, Close-In Weapon System". Deagel.com. Retrieved 2010-04-13. ^ "INS Jalashwa". bharat-rakshak.com. Retrieved 2015-04-16. ^ "Mexico Missile Boats". HAARETZ.com. 2003-12-23. Retrieved 2013-04-10. ^ "Raytheon to deliver 9 Phalanx CIWS to Republic of Korea Navy". February 25, 2014. ^ "World Navies Today: Thailand". Hazegray.org. 2002-03-25. Retrieved 2010-04-13. ^ "FY97 Annual Report - PHALANX CLOSE-IN WEAPON SYSTEM (CIWS)". Globalsecurity.org. Retrieved 2016-01-05. 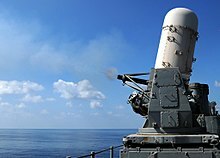 Wikimedia Commons has media related to Phalanx CIWS.